At Rio Nutrition, we are so much more than a regular feed company that sells supplements to ranchers. There is a certain buzz about our team...a certain passion that is unmistakable...an excitement that flows through the entire team. People who come in contact with us pick up on it right away. Just the other day a woman visited our location in Redwood Falls, MN. She said that we have a nice office space but the thing that she really noticed the most was that everyone was smiling! What drives this magic passion, quite simply, comes back to the impact that we have on the ranching industry. As our founder and CEO, Trevor, humbly says, "It’s all about helping ranchers get more out of what they’ve already got! Optimizing their resources. Getting more out of their grass, hay, forages." The power of Nutrizorb, the digestion tool, is undeniable! And it’s an ingredient that’s included in each of our products. What the University of Minnesota found during the studies they conducted on Nutrizorb was that it improved the TDN value of forage by three percentage points. Dr. Alfredo DiConstanzo, professor of beef cattle management at the U of M, indicated that Nutrizorb changed the dynamics of digestion. It makes a poor quality hay function like a third trimester hay. Read more study results here. We are not changing the cow, hay or forages...but what Nutrizorb IS changing is the way they interact. Here’s some feedback from a rancher in South Dakota, it supports the findings of the U of M study. "I’ve been feeding Riomax for several years. I used to run 425 cows on my land, now I run 625 cows on the same land!" It’s abundantly clear what changing dynamics can do for ranchers. For the rancher quoted above, it increased the carrying capacity of his land by 47%! Rather than focusing only on what the product costs (which we agree is important), turn your focus to how it can make a significant impact on profitability and efficiency. 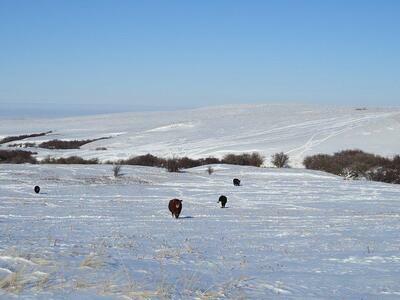 Learn more about our low cost wintering program. We are moving the needle! As one rough cut cowboy once said to us, "Your products have enabled us, a bunch of idiots, to look like geniuses." Read more rancher results here. Folks, if you run cows on grass...Rio Nutrition can help you! Another wise rancher once told us, "Ranchers are actually ‘grass farmers’. The cows are just the means by which they market their grass." Where we fit in is, helping ranchers do a better job managing their land base so that they can be more profitable as ‘grass farmers’. We are an easygoing bunch here at Rio Nutrition. Don’t hesitate to call, email, or go online to get in touch with our people....we’d love to help you!